How much is a dollar raise annually? How to calculate pay raise. How to figure out pay increase percentage. How much of a raise to ask for? Enter the amount you are currently being paid per increment of time (hour, day, week, bi-weekly, semi-monthly, monthly, etc.). Select whichever time period corresponds to the pay rate you entered in the first line. Select the type of raise you are entering. If you know the new pay rate amount, select New rate. If you want to enter the dollar amount of only the raise itself (getting a $1 per hour raise), select Dollar amount increase. If the pay raise is a percentage increase, select Percent amount increase. Once you have selected the type of raise you are entering, enter the corresponding factor (dollar raise, percent raise, new rate) on this line. Enter the number of hours you work per work week. Enter your current age. The calculator will use this entry to calculate potential earnings on your raise if you choose to invest it rather than spend it. Enter the age you expect to retire at. The calculator will use this entry to calculate potential earnings on your raise if you choose to invest it rather than spend it. Enter the percent return on your investment you believe you could earn between now and when you plan to retire. The calculator will use this entry to calculate potential earnings on your raise if you choose to invest it rather than spend it. 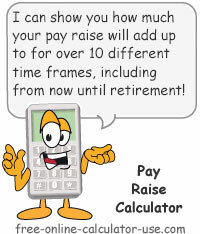 Your new pay rate based on your pay raise calculator entries. This is the percentage increase of your pay rate dollar amount increase. This online pay raise calculator will calculate your pay raise or cost of living (COL) raise based on either a dollar-amount increase or on a percentage increase. If you enter a dollar amount increase, the calculator will calculate the raise percentage. Or, if you enter a raise percentage, the calculator will calculate the dollar-amount increase. And since you can select an annual pay period and enter an annual wage, the calculator also doubles as a salary increase calculator. Plus, the calculator will translate the effects of your pay raise into ten different time periods -- including how much the raise will add up to between now and when you plan to retire! And finally, the calculator will even calculate the effects of investing your pay raise versus spending it, and display a bar chart showing the difference. Enter your current pay rate. Select the pay period that corresponds to the rate entered in Step #1. Select your pay raise type (dollar amount increase, percentage amount increase, or the new rate of pay). Enter the pay raise value that corresponds to the type selected in Step #3. Enter the number of hours you work per week, regardless of whether you are paid an hourly wage or a salary, and regardless of how often you are paid. Enter the annual rate of return you think you could earn if you invested your pay raise instead of spending it. Click the "Calculate Pay Raise" button. This will display your new rate and the percentage increase, plus display a chart showing how the raise will add up over ten different time periods. Finally, the calculator will also report the interest you could earn on top of the raise if you invested it rather than spent it. The following time period conversion chart lists the number of periods per year used by the pay raise calculator. What a dollar raise equates to, how to calculate raises, and how much to ask for. If you are paid for 40-hours per week, and for 52-weeks per year, a $1 an hour raise will add up to $2,080 extra per year. The following dollar raise calculator will calculate the annual effect of other pay increase scenarios. To calculate your pay raise based on a percentage increase, convert the percentage to a decimal number (move decimal point 2 places to the left) and multiply your current pay or salary by the decimal number. To calculate your pay raise percentage based on a dollar amount increase, subtract your current pay or salary from your new pay or salary, divide the result by your current pay and convert that result to a percentage (move decimal point 2 places to the right). If you want to estimate your raise after taxes, calculate your Net Paycheck with and without the dollar amount increase. That depends on your value to your employer and on how well the company is doing. Obviously, if you're not contributing to your employer's bottom line, and your employer is struggling to make ends meet, asking for any size raise might not make sense. On the other hand, if you know your work is generating profits for your employer, and your employer's bottom line is growing, it wouldn't be unreasonable to ask for a 10% to 20% increase over what you are currently earning. But in either case, if you don't get an annual raise equal to the inflation rate (see Salary Inflation Calculator), your buying power will decrease even if the size of your paycheck stays the same. Who Ultimately Determines Your Earnings? Who is ultimately responsible for how much you earn from the time you spend serving an employer? If you're not sure, here's a clue. It's NOT your employer. First of all, having been an employer myself, I can tell you that your employer would love nothing better than to pay you what your time, talents and skills are worth to the company. After all, your employer is competing for employees just as much as you are competing with everyone who desires your job. If the employer is not paying you what you believe you are worth, there are only three possible explanations. The company is not able to effectively compete in their marketplace (they might be in desperate need of better employees). Your value to the company is less than you perceive it to be. A combination of reasons #1 and #2. Contrary to what you might think, your employer is not continuously scheming for ways to make you work harder for less money. If your employer is profitable, they are certainly smart enough to realize that if they don't compensate their best employees with competitive wages, they will lose their best employees. They are also smart enough to realize that if they lose all of their best employees, they will likely no longer be profitable. So the first part of the "increase your pay" formula is to make sure you are, and continue to be, one of your employer's best employees. This will insure that you are paid as much as the employer can afford to pay you based on their earnings. And if you want to help your employer increase their earnings, encourage your co-workers to become "best" employees as well. What many employees fail to realize is that their employer is the goose that lays golden eggs. How so? Because each dollar you receive from your employer comes with built-in earning potential. If you invest a portion of each dollar you earn, you will continue to earn income from each hour's work ... for the rest of your life. Viola, Golden Eggs! However, if you fail to invest any portion of the dollars your employer is paying you, and instead spend them all on non-appreciating purchases, you have effectively turned the potential Golden Eggs into Rotten Eggs. So the second part of the "increase your pay" formula depends on what you do with what your employer is paying you. What's the most effective way to go about asking for a pay raise? Find a full length mirror, position yourself squarely in front of it, and then ask the person in front of you if they could please become worthy of a pay raise and stop turning all of your Golden Eggs into Rotten Eggs.